Find yourself buying those packets of gravy mix at the store? They are handy for making gravy super fast on a busy night, but you should never buy them again! You have the ingredients already to make your own mix! Take 5 minutes to make a large bulk batch and store in your refrigerator. You can control the ingredients and save money. Play around with your seasonings, but I'll list some to get you started. makes about 2 2/3 cups mix. sage, thyme onion powder, pepper (read quantities for each below). In a food processor combine butter or margarine with dry ingredients until well blended. store in a container with tight fitting lid. Label and date contents. and tape directions below to container. Store in refrigerator. use within 6 weeks. Pour water in a saucepan. Use a whisk to stir in gravy mix. Stir constantly over medium heat until gravy is smooth and slightly thickened, 2-3 minutes. Ooh, I want to try this one too. Thanks! That is easy, and I do have all those things on hand! So much more economical than buying the packets. Thank you! So exciting. Do you think I could use butter powder? Tara, I only have a small amount of experience with Butter powder. I think there would be two ways to do it. Make the Butter Powder into the butter and then mix into the mix recipe above, OR add the butter powder into the recipe enough to equal the amount of butter you'd need to use in the recipe, then increase the water when making the gravy to accomodate how much your butter needs. Does anyone else know if this would work? I'd love to hear! I add butter when cooking it , that way I can store it in cabinet I have small fridge not a lot of room for storage and it has kept for 6 months now going to have to make more soon. Emanda, I am so glad to hear you found a way around the space issue and that it is working out great for you! Thanks for sharing! We discussed the shelf life issue on pinterest ... I live in Central Texas so deal with heat and believe it or not often humidity as well. My thoughts are thus. 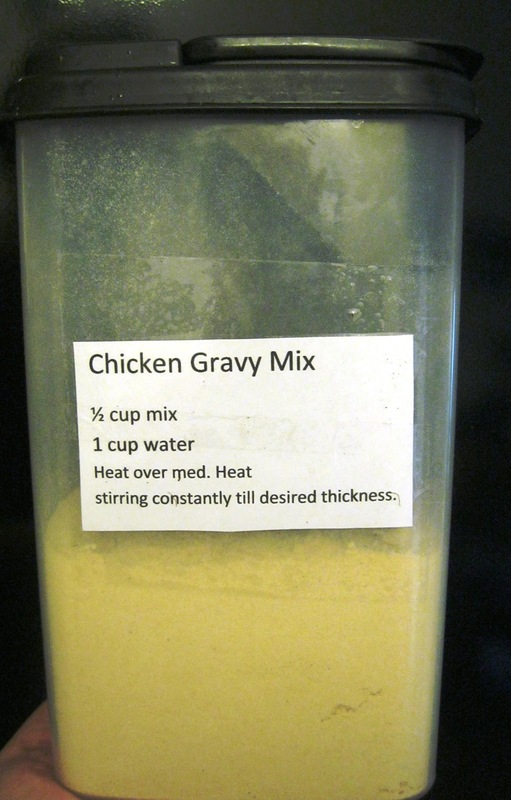 The recipe makes up approximately 2 1/2 cups - each recipe of gravy takes 1/2 cup. Make it up when you will need gravy that day and store the rest in a pint sized mason jar that has been vacuumed sealed (love my foodsaver). The jar can be resealed as many times as necessary and thus keeps the mix relatively fresh. Of course if you make gravy often shelf life will be unimportant. Thanks for sharing the recipes. Love the ideas! I have had no luck with foodsavers! I think I pick out the duds! I have given up on them, but have heard many people that have done well with the first one they ever bought. I have never thought much about shelf life due to the fact that I have been feeding teenagers (mainly football playing boys) for so many years that food never lasted long enough to know! Now that I am a new empty nester, guess what I found out??? Milk has an expiration date! Who knew? And now the pressure to use it all up before then? I don't know if I"ll adjust to this stuff! Love your ideas, please share your tips ANY TIME!